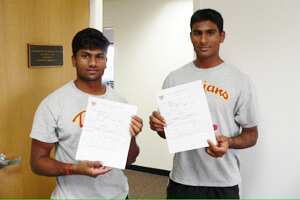 It’s an unlikely fairy tale for Rinku Singh, 20, and Dinesh Patel, 19. Both boys, now signed up with the Pittsburgh Pirates baseball team in the US as rookie pitchers, have seen their lives turned upside down over the course of the last year. Click here to watch the video of which features both pitchers in training and comments from their agents and trainer. /Content/Videos/2008-12-24/Lounge_Baseball.flv0b5aa796-d0de-11dd-a8e6-000b5dabf636.flvSingh and Patel participated in a talent hunt competition, called The Million Dollar Arm, organized by a US-based talent management company and broadcast on the Zee Sports TV channel through March. J.B. Bernstein of 7 Figures Management hit upon the idea of tapping the Indian market for talent after watching a cricket match. After a national hunt, which gave 30,000 participants the chance to fling a baseball, Singh and Patel were picked for their speed and accuracy. Subsequently both pitchers began a year-long training programme in Los Angeles in May and later raised eyebrows when they were both signed up by the Pittsburgh Pirates Major League Baseball franchise. For Major League Baseball and the Pittsburgh Pirates it is a chance to take the game to a new, untapped, and currently uninterested, audience in India. They will hope that Rinky Singh and Dinesh Patel will do for baseball in India what Yao Ming did for basketball in China. This video features both pitchers in training and comments from their agents and trainer.